For several consecutive years, the Lone Star State has taken in more than 500,000 new residents annually from other states and around the world. 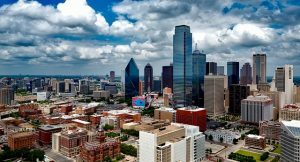 Of those numbers, the majority of new out-of-state residents are flocking to the Dallas-Fort Worth area. Real estate experts say that the biggest draws for new residents tend to be the variety of job opportunities and the high quality of life. In Texas, there are more buyers coming in than sellers leaving. Since most people move for either opportunity or affordability, it shows that Texas is many people’s choice for both. For all of our new neighbors coming into the state, our Dallas and Fort Worth storage facilities can offer huge benefits throughout the moving and buying/selling process. Belongings can be stored before and after being transported, and they can be organized and kept out of the way for those using staging to sell their homes. Before selling a home, homeowners and professionals alike can increase their chances of a great sale by using a process called “staging.” Staging involves decluttering, redecorating, and rearranging a home in order to show off the home’s strengths and minimize any areas of weakness it may have. Staging has become a very reliable way to sell a house for a good price in a short amount of time. Even though it often involves a small cost, most people find that it is well worth it because a house is, for most people, their most important asset. Clean and Declutter: Cleaning and decluttering are at the top of any staging list. Just like all of us, potential home buyers can always use some help activating their imaginations. They need to see a clear and clean home in order to see themselves enjoying life there. Cleaning and decluttering will also emphasize a sense of space, which makes a home seem larger and more open, both of which are appealing to potential home buyers. Go Neutral: For a potential home buyer to be able to see themselves in their new home, it needs to not look like someone else lives there. Most experts recommend that a home be staged with decor of neutral styles and colors. It’s also advisable to remove personal effects that represent beliefs or opinions, including things like religious symbols and sports paraphernalia. Repair and Refresh: Repairs and freshened up surfaces are important for both the inside and the outside of any home on the market. It is best to make sure that any cracks, scratches, or dents are repaired. Floors should be shiny and porches swept. Where possible, the paint should be freshened up and all surfaces should be cleaned and shined. Make it Welcoming: A home’s interior and exterior areas can be made more welcoming with just a few important staging choices. The first is in the area of lighting. A well-lit home is always going to be more appealing. If the home is being shown at night, all of the outside and inside lights should be on to enhance the ambiance. The second thing is flowers. Fresh flowers—not silk or plastic flowers—appeal to buyers very quickly. Experts say that home buyers would rather look at one beautiful orchid than five fake arrangements. The last of these is smell. The smell of a home is immediately evident to a potential buyer. Most staging and real estate experts will recommend that cookies or fresh bread be baking during a showing. This works in reverse as well for the negative. A home that has odd smells, either from cleanliness issues, pets or from cooking, will be an immediate turn off to most potential buyers. Bargain Storage has recently renovated and expanded our locations in the Dallas-Fort Worth area. For self-storage in Dallas there are two locations, including the Oak Cliff location and our large Desoto location. Self-storage in Fort Worth is available at any of our three locations, including Fort Worth – West, which serves residents near the Ridglea Hills, Chapin, Alameda, and Montserrat areas; Fort Worth – Eastchase, which serves the residents near the Village Creek and Waterchase Golf Club areas; and our recently renovated location on the East Side of Fort Worth, which serves residents near the I-820 and Lake Arlington area. We are proud to help support the transitions of so many families and professionals as they join our neighborhoods and communities. Contact us today to learn more about our self-storage units and how we assist you in your transition.